Centre for Research and Information (CRI) on 31st July 2018 organized a “Policy Café” with the youth entrepreneurs and ICT Advisor to the Honourable Prime Minister, Sajeeb Wazed at Utshab Hall, Radisson Blu Water Garden Hotel, Dhaka. The topic of this session was “Redefining Employment”. Around 300 youth entrepreneurs from a cross section of society took part in this interactive discussion. Policy Café on Redefining Employment was moderated by Barrister Shah Ali Farhad, Senior Analyst, Centre for Research and Information (CRI). The programme started at around 3:30 pm and continued till 6.00 pm. CRI organized this Policy Café to learn what are the Bangladeshi youth think about current employment situation in Bangladesh, how they define employment, what are the traditional views of the people regarding employment, are there any difference between employment and job, what are the stereotypes regarding employment. Findings of extensive desk research indicate that in last nine years a substantial number of employment has been created and there is no official data on the employment generation in non-traditional sector. The state run Labour Force Survey (LFS) of Bangladesh Bureau of Statistics (BBS) does not acknowledge the big picture of massive employment generation in non-traditional sectors. The policy café was specially designed to explore what are the enabling factors behind these massive employment generations in non-traditional sectors, what are the challenges to be faced and expected policy support required to maintain constant growth in these sectors. Around 300 young entrepreneurs from diverse segments of non-traditional workforce currently contributing to the economy and creating a substantial number of employment. Generically, there are two sectors of non-traditional employment. ICT based entrepreneurship and Non-ICT entrepreneurship. Agro food production, poultry, livestock, travel and tourism, service, transport, logistics, water and sanitations, software and program developer, startup incubators, e-commerce, f-commerce, restaurant, garment, business research and consultancy farm are among them. ‘ICT, Digital Bangladesh and Employment’ was the first segment of Policy Café on Redefining Employment. In the opening discussion, the panelist discussed ‘How ICT has created employment in Digital Bangladesh’. The panelist came up with their personal stories of success and struggle, the recent stats of employment generation in non-traditional ICT sector. Besides, as part of the interactive discussion, the participants also shared their success stories and made insightful comments on how the existing policies can be made more ICT entrepreneur friendly. Non-Traditional Employment was the second segment of Policy Café. This session also started with insightful opening discussion by the panelists who are working in non-traditional sectors and creating employment. After the opening remarks of the panelist, the participants who are also in different segments of non-traditional workforce, shared their insights. 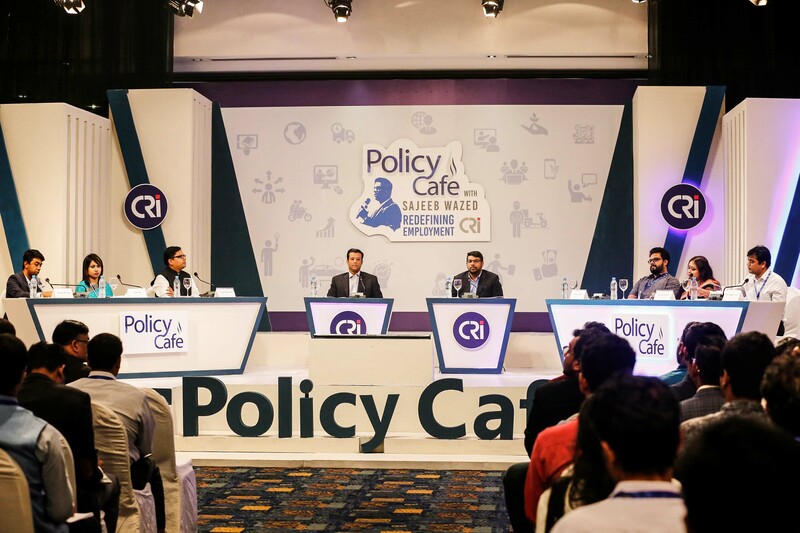 The final segment of Policy Café was ‘Employment as the Key to a Developed Bangladesh’. This session was more focused on the key policy issues that will create more enabling environment for the emerging entrepreneur to grow and flourish. The discussion started with the opening remark of the guest and key speaker, Mr. Sajeeb Wazed, ICT Advisor to the Honorable Prime Minister, Government of the People’s Republic of Bangladesh. He was asked by the moderator that how he defines employment. The ICT Advisor looks employment from a different perspective. He pointed out the stereotypes regarding employment prevailing in the society. Only doctor, engineer or lawyer are not professionals. There are more professions and professionals as well. He again pinpointed that once the government was the largest employer in Bangladesh but the scenario radically changed in last 9 years. Now the private sectors have the lion share of creating and generating employment in Bangladesh and among these jobs and employment opportunities, a substantial portion is non-traditional jobs. He added that these enabling environment created by constant innovation and policy support from the current government in last 9 years. He acknowledged that emerging entrepreneurs are adding value to the economy and contributing to the constant growth of Bangladesh. These small steps and initiatives taken by the entrepreneurs will create a big buzz. The panelist Zunaid Ahmed Palak MP emphasized about sensitizing the parents and teachers about current global and national trend of employment to break the stereotypes regarding employment. He emphasized on exploring the new non-traditional sectors of employment creating opportunities. He shared his insights and stories of his journey in making Bangladesh Digital Bangladesh under leadership of Mr. Sajeeb Wazed. He shared about an initiative Startup Bangladesh which will work on venture capital investments. This government intervention will have enormous impact in fostering a constant growth and innovation. Startup Bangladesh’s goal is to create an accelerator and its accompanying ecosystem of entrepreneurs, investors, mentors, advisors to promote Bangladesh as a global hub for tech entrepreneurship. The entrepreneurs discussed some problems and struggles they having to run their business. To answer their question, Sajeeb Wazed said, the government’s job is to create enabling environment for entrepreneurship development and the government continuously working on creating enabling environment for doing business and providing policy support to ensure steady growth of their business and country’s growth as well. He added that when the emerging entrepreneurs grow, the country grows as well. On the unemployment issue, Mr. Sajeeb Wazed said unlike many other developing countries and developed nations, the unemployment rate in Bangladesh is very low—at a mere 4.2 percent. Even though, he said, this rate excluded the non-traditional employment scopes such as Pathao, and Uber ride-hailing services. He said around 400,000 employments, excluding those in mobile banking sector, have been created. He pointed out that the unemployment rate is 9.2 percent in France and 5.5 percent in Australia. In 2017, over 1.4 million employments have been created in the country and still it is growing. Throughout the duration of the program Mr. Sajeeb Wazed was extremely interested in knowing what specific actions and/or steps can be taken on part of the government or policy makers in facilitating their ideas to become innovators and accommodating them to reach their goals. The event ended with refreshments being served to the participants. He thanked CRI for organizing the programme and asked the young people to involve with volunteer activities of CRI in order to play a more instrumental role in the research of policy making. Participants than had the chance to get photographed with the Mr. Wazed and the panellists and share some light moments.